Some people, including many Christian writers, have used the terms devil and demon almost interchangeably. But although devils and demons sometimes seem to be closely related or even identical, they also appear in myth and religion as two quite different creatures. Devils. In most mythologies and religions, a devil is a leader or ruler among evil spirits, a being who acts in direct opposition to the gods. The general view is that devils are trying to destroy humans, to tempt them into sinning, or to turn them against their gods. Monotheistic religions often speak of one Devil, just as they recognize one God. Devils and gods may be opposites, but they are also usually linked in some way. Many religious and mythological explanations say that devils are related to the gods or that they are gods of evil. Demons. A demon (sometimes spelled daemon) is generally thought to be a harmful or evil spirit or supernatural being, sometimes a god or the offspring of a god. Demons may be the messengers, attendants, or servants of the Devil. They are often monstrous in appearance, combining the features of different animals or of animals and humans. Demons were not always regarded as evil. The ancient Greeks spoke of a person's daimon as his or her personal spirit, guardian angel, or soul. In many cultures, demons were merely inhuman supernatural powers that could be evil or good at various times, depending on whether their actions harmed or helped people. Human witches, wizards, and sorcerers were thought to gain some of their abilities by summoning and controlling demons through magical practices. The spread of religions has had an interesting effect on demons in world mythology. When one religion replaces another, the gods of the former religion may become demons in the new faith. For example, as Islam spread through West Africa, Central Asia, and Indonesia, some local deities did not disappear but were transformed into demons within a universe governed by the God of Islam. Devilish and demonic forces have taken many shapes and forms around the world. Frightening and dramatic stories and images of them have always had considerable appeal. Egyptian Mythology. The devil could be seen in the evil god Set in ancient Egyptian mythology. Once a helpful god who ruled the kingdom of the blessed dead, Set's place in the Egyptian pantheon changed after he murdered his brother. Followers of the supreme god Horus conquered Set's followers, and the priests of Horus made Set the enemy of the other gods and the source of evil. The Egyptians believed in the existence of demons. One such demon was Nehebkau, who appeared at times as a powerful earth spirit, a source of strength for the other gods. At other times, though, he was a menacing monster, a serpent with human arms and legs who threatened the souls of the dead. Like many demons, Nehebkau had more than one role. Judaism and Christianity. Hebrew or Jewish tradition, later adopted by Christians, calls the Devil Satan, which means "adversary." Satan took on qualities of Ahriman, becoming the prince of evil, lies, and darkness. Jewish tradition also includes a female demon known as Lilith. Said to be the first wife of Adam, Lilith was cast out when she refused to obey her husband and was replaced by Eve. In Christian belief, the Devil came to be seen as a fallen angel who chose to become evil rather than worship God. Satan rules the demons in Hell, the place of punishment and despair. In the Middle Ages, some Christians believed that a separate devil—or a separate aspect of the Devil—existed for each of the seven deadly sins. In their view, Lucifer represented pride, Mammon greed, Asmodeus lust, Satan anger, Beelzebub gluttony, Leviathan envy, and Belphegor sloth. A group of Hindu demons, known as the Rakshasas, served the demon king Ravana. 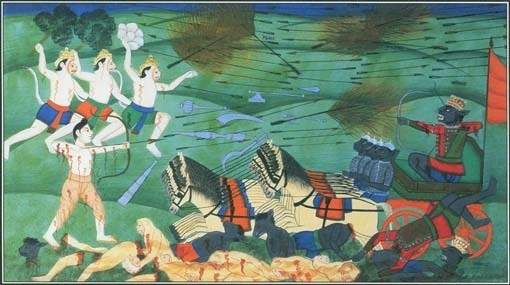 This painting shows a battle between the evil king and the hero Rama. hooves are like those of satyrs and other animal gods of ancient Greece. The trident he is often shown brandishing is similar to those carried by the Greek gods Poseidon (Neptune), god of the sea, and Hades, lord of the underworld. The Hindu god Shiva, who represents the powers of destruction, also carries a trident. The Devil sometimes appears in other forms, such as a winged snake or dragon. Islam. In the Muslim religion of Islam, which shares many elements of Jewish and Christian tradition, the Devil is called Iblis or Shaitan. Like Satan, he is a fallen angel. He commands an army of ugly demons called shaitans, who tempt humans to sin. The shaitans belong to a class of supernatural beings called djinni or jinni (genies). Some djinni are benevolent or neutral toward the human world, but those who do not believe in God are evil. Hinduism and Buddhism. In the earliest form of Hinduism in India, the gods were sometimes called Asuras. But as the religion developed the Asuras came to be seen as demons who battled the gods. Another group of demons, the Rakshasas, served the demon king Ravana. Some were beautiful, but others were monstrous or hideously deformed. One demon, Hayagriva (meaning "horse-necked"), was a huge and powerful enemy of the gods whose troublemaking constantly threatened to overturn the cosmic order. The Buddhist religion incorporated many elements of Hinduism, including the demon Hayagriva. It turned the Hindu demon Namuchi into Mara, the Evil One who tempts people with desires and deceives them with illusions. Mara tried to tempt the Buddha. He failed—but he still tries to keep others from reaching enlightenment. Chinese and Japanese Mythology. Although traditional Chinese and Japanese religions did not recognize a single powerful devil, they had demons. In Chinese legends, the souls of the dead become either shen, good spirits who join the gods, or gui, malevolent ghosts or demons who wander the earth, usually because their descendants do not offer them the proper funeral ceremonies. Japanese mythology includes stories about demons called Oni, generally portrayed with square, horned heads, sharp teeth and claws, and sometimes three eyes. Oni may have the size and strength of giants. Although these demons are cruel and mischievous, some tales tell of Oni who change their ways and become Buddhist monks. African Mythology. The Bushpeople of southern Africa say that Gauna, the ruler of the underworld, is the enemy of Cagn, the god who created the world. Gauna visits the earth to cause trouble in human society and to seize people to take to the realm of the dead. He also sends the souls of the dead to haunt their living family members. See also African Mythology ; Ahriman ; Angels ; Buddhism and Mythology ; Chinese Mythology ; Faust ; Gauna ; Genies ; Hell ; Hinduism and Mythology ; Japanese Mythology ; Lilith ; Monsters ; Persian Mythology ; ; Set ; Witches and Wizards . In Islam Eblis is not an Angel, rather he is from the Jin and refuse to obey God, Jin are not necessarily evil, they are like Humans can follow any religion including Islam Christianity etc, but those who are followers of Eblis are the devils / shaytans. In islam Satan (called Iblis) was/is a fallen angel, who was named Azazel (the leader of the Watchers in 1 Enoch, a demon whose name appears once in the Book of Leviticus and is translated 'Scapegoat')there is much conflict over weither or not he was a Jinji or an Angel, in Koran 2:34 Satan is called a Jinji but the command of God to bow before Adam (which by Iblis was refused, resulting in his fall) was issued to the angels, not the Jinn. In Islam, Iblis WAS NOT an angel, and was never be. Iblis is a being made of fire (djinn), unlike angels which are beings made of light. There's no reference about Iblis the same as Azazel whatsoever in Islam, that's Christianity point of view. Yes, in Christianity there is a concept of fallen angels, but not in Islam. The djinn (or Jinji, whatever you called it) as spoken in the Koran weren't angels. My encounters with god. Not by sight or by hneairg. But by his signs. We are all ignorant. We need to understand what we do to ourselves and yet we try to blame others. FAITH! Is the key. I can say more but I don't want to argue with anyone. Who am I? Just another man who happens to have god in his life and is still trying to figure out what's going on? with mankind and myself. For I have seen his signs. Keep your eyes open. The smallest thing might even be him telling you something. When the heart of a human being starts to feel the weight and shame of the wrong that we have done and the felling of change is pushing towards your life. Praise the living God, repentance has started.. not knowing where to turn can be frustrating. Thats why Faith comes by hearing and hearing the Word of God.. If we feel we have never really done anything wrong then how can we really understand the forgiveness that is found in JESUS CHRIST alone..